Eric Flam graduated with a Bachelor's Degree in Music Theory and Composition in 1993 from Washington University in St. Louis, Missouri. 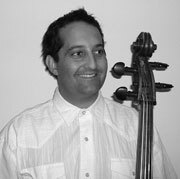 Eric began his music studies on the violoncello at the age of six with a family friend, Michael Sher. He studied with Nina Manuelin, cellist with Long Island Philharmonic, from the age of 13 till the age of 18. At university he studied with Beth MacDonald, playing chamber music, symphonic music and operatic music. At University Eric studied piano and classical guitar as part of his degree and played contemporary guitar in his own garage band. Eric is currently the principal cellist of the Steamboat Chamber Orchestra. He plays cello with the Emerald City Opera, performing in the inaugural opera, "The Magic Flute" and this past summer, "La Boheme". Eric also plays in various chamber groups in Steamboat Springs, performing for weddings and parties throughout the year. Currently Eric runs his own private music studio teaching violoncello, classical and contemporary guitar and piano.